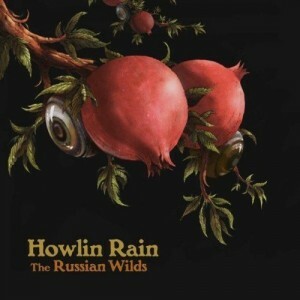 If you are listening to a record by Howlin Rain chances are you are looking for some high quality rock music of the type that had its golden age in the 1970s; if so you will no doubt be very satisfied with The Russian Wilds. It picks up where their 2008 record Magnificent Fiend left off, while at the same time being a bit more focused and polished. Usually those are terms that would indicate a drop in quality or a more mainstream approach when it comes to rock music, but that is hardly the case here. Howlin Rain is back and they are just as good, with a slight twist. Howlin Rain frontman Ethan Miller originally formed the band while in still in the Californian psych/noise act Comets on Fire in 2004. The band was started with the expressed intent to play more melodic and classic sounding rock music, and their first two records were great examples of 1970s-style rock done right for the 2000s, being true to their roots but never retro. The Russian Wilds keeps to that formula, albeit with the Grateful Dead influence turned down in favour of a more muscular rock approach. Ethan Miller has clearly grown as a vocalist during the past decade and he utilizes his voice to the best effect on The Russian Wilds, proving himself on both rock tracks such as the cinematic single “Phantom in the Valley” as well as quieter moments like the tender first half of “Strange Thunder.” Even if the more psychedelic and Americana-like moments on Magnificent Fiend were among my favourites there, the transition to a harder-edged sound here works very well. Influences from proto-metal like early Black Sabbath blends seamlessly with Howlin Rain’s own sound taking them closer to early The Black Crowes than The Grateful Dead, while still retaining their own identity. The Russian Wilds is hardly going to shock you to the core, but it’s a more than able record by one of the most consistently strong groups in its genre. Howlin Rain retains their trademark sound, completely with strong songwriting, excellent musicianship and a playful feeling, all captured with warm and crisp production. There are few bands who make 1970s style rock as good as Howlin Rain does it – but as long one is okay with the throwback style this is one particularly fine rock record.